“The crisis began in late November when Ukrainian President Viktor Yanukovych snubbed a plan to sign an Association Agreement and trade pact with the EU after Russia persuaded the most populous former Soviet republic to stay in the Kremlin’s orbit. 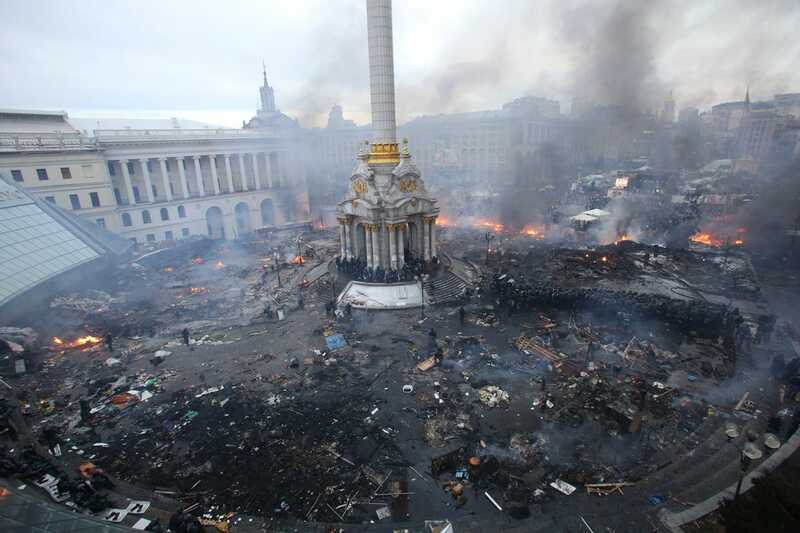 Citizens subsequently flooded the streets and made Independence Square, aka Maidan, their base in central Kiev. 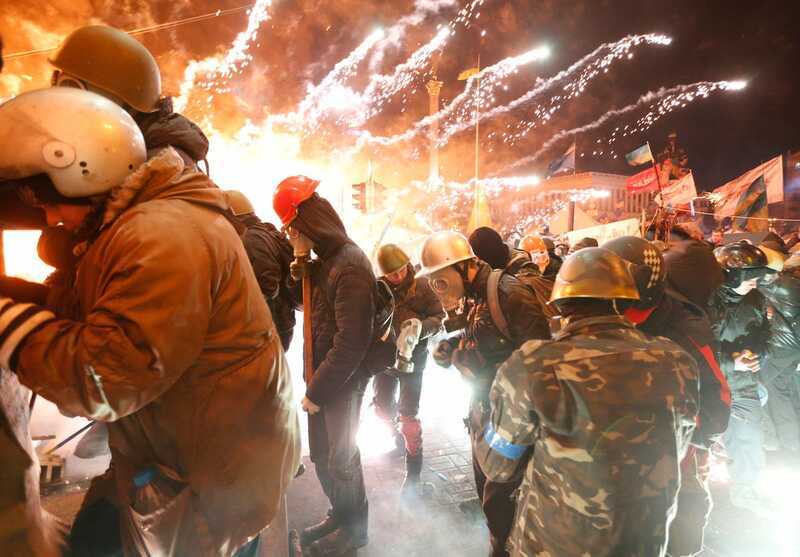 The confrontations between the opposition and Yanukovych’s government have been escalating since. 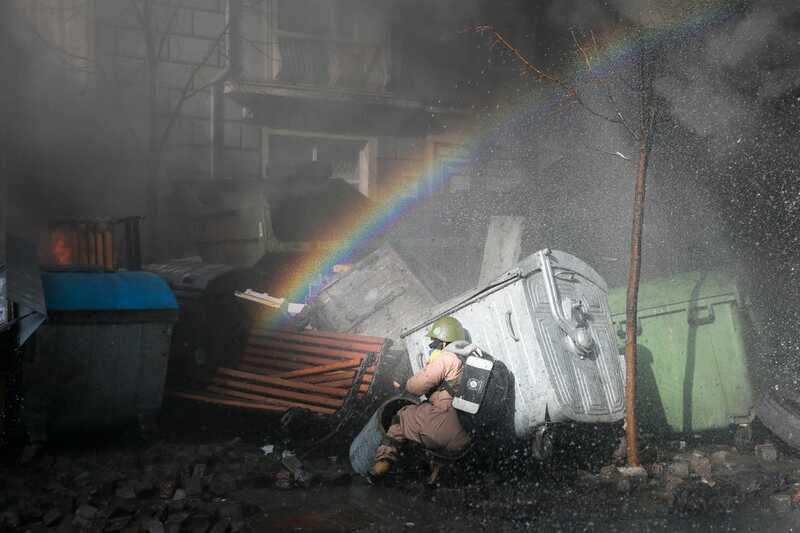 An anti-government protester gestures towards riot police during clashes in Independence Square in Kiev February 18, 2014. 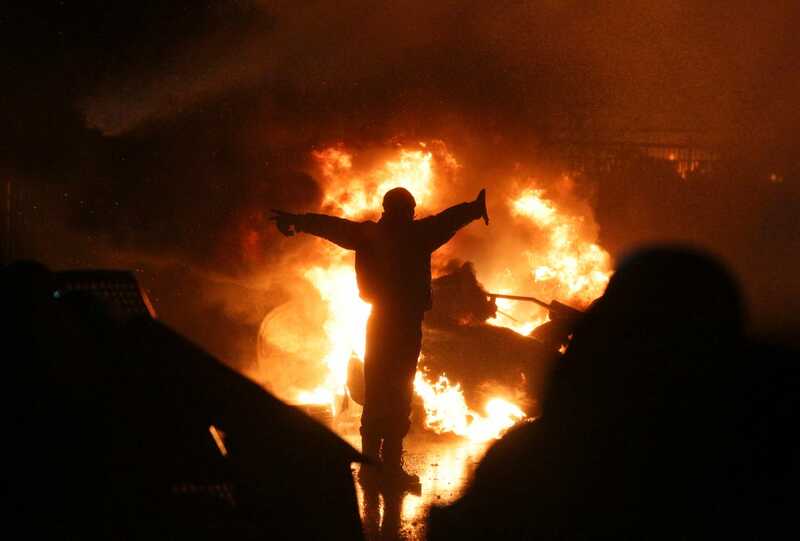 Kiev streets have been burning throughout the protests. 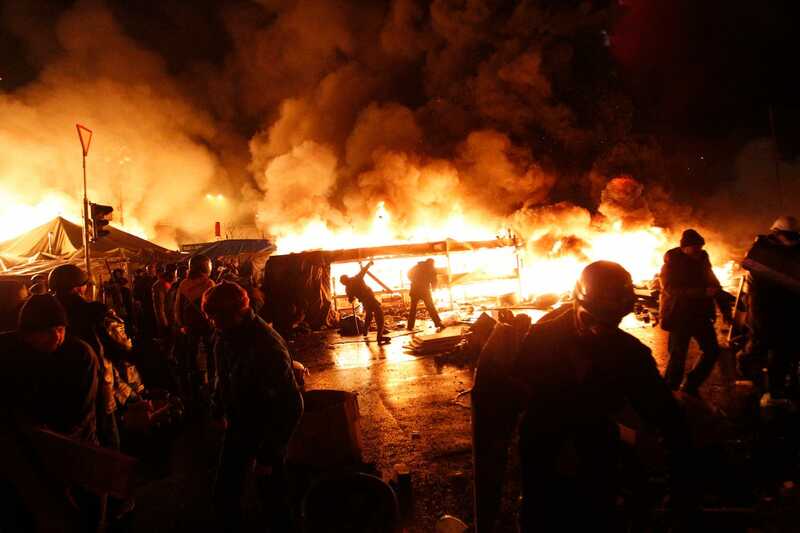 On Tuesday, the Maidan was particularly alight. Leading to some incredible fireworks admid the violence. Protesters have used rocks, slingshots, catapults, and Molotov cocktails. While crude, the mixture of flammable liquid inside the bottle of a Molotov cocktail has proven very effective. An anti-government protester finds cover during clashes with riot police outside Ukraine’s parliament in Kiev, Ukraine, Tuesday, Feb. 18, 2014. An aerial view shows Independence Square during clashes between anti-government protesters and Interior Ministry members and riot police in central Kiev February 19, 2014. MMORPG Roma Victor is crucifying naughty players rather than banning them. Walking to work this morning, it occurred to me that I am very lucky that a good cross-section of the local youth have obliterated most of the more traditional means of seduction. Comfort drugs and the threat of sexual infection have granted me an equanimity that I would not have had before. We all pull hair, we all scratch backs, we absently rub out the aches in feet that find themselves near out laps. The hormonal ocean is absent, there’s no confused motivations lapping at our hands or the words we apply to our situations. 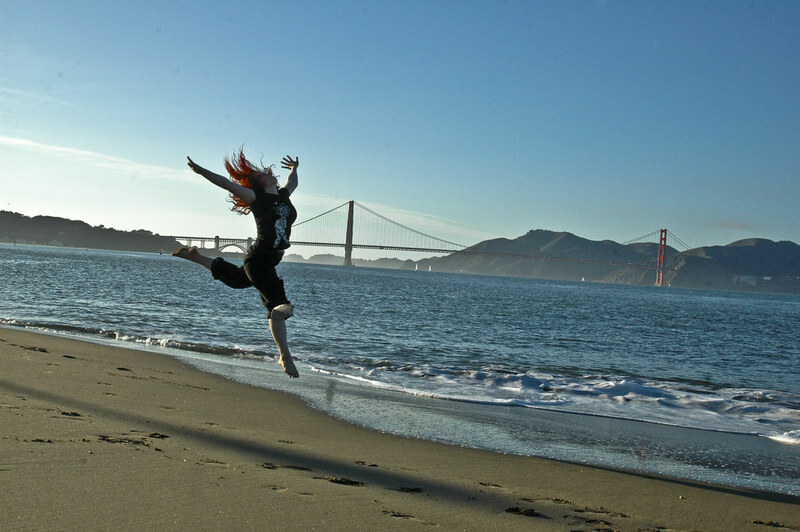 Sleeping is sleeping, usually, and staying overnight is fun, not a promise. I really like that. I appreciate the freedom it grants.